By: Juanita Constible, Luke Sandro, and Richard E. Lee, Jr. 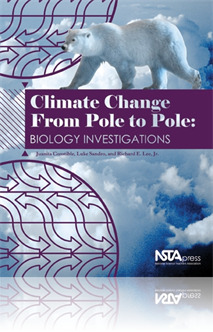 Climate Change From Pole to Pole: Biology Investigations offers timely, relevant, biology-based case studies and background information on how to teach the science of climate change. The six painstakingly researched and field-tested activities, which build on four content chapters, give students the opportunity to solve real-life scientific problems using guiding questions, graphs and data tables, short reading assignments, and independent research. This volume provides an authentic and rigorous way to engage students in science and environmental issues—scientific methods, evidence, climate, and biological effects of climate change—and is a unique and essential resource for your high school or college-level classroom.